Mairead took advantage of the KG VIP sample sale from all the way across the pond. Have you? SS '18 goodies are on the way. We'll drop the date next week so you can get in on it first! I thought about you because I have come to realize how neglectful I am with taking pictures. When I’m in my zone - working on collections or special projects- stopping for a photo is the last thing on my mind. But I’m missing so many opportunities to share my creative ideas with you! Tell me what you think about this veil (headband) and hat combo (yes, I'm up and at it early this morning)! I can show you how to create the look, just let me know if you want to see a video on it. Or if you’re not the “make it myself” type, I’ll create a version for the next collection. But only if I hear from you! And of course, I'm wearing this full-on gown to the shoot - I'll remix it of course! Please let me know if you're watching the videos too and tell me when/how you remix your wardrobe. I have more on the way! The response so far has been incredible - we should have brought this to you a long time ago. My bad! While I was getting today's video together for you, Shelly put her foot in curating an Ahh-mazing selection for your private sample sale! Don't believe me because she's my little sister (and of course I know she's dope)? Sign up below to check it out for yourself! Remember: it opens up to the public on Monday, April 2nd at 9am est but if you want to get there first, you have to be on the email list. Ok... Did you get anything valuable from the tips and tricks this week: The belt bag, dresses over pants and metallics during the day? I hope so. Let me know! Today's video is on the ever challenging "Mixing Prints". Here I show you stages on approaching mixing prints from beginner to advanced and the rule of thumb that makes it less intimidating. And this is coming from the girl who always matched my Champion sweatshirt with my 54-11s (Google that Brooklyn reference ;-)! The inquiries about this suit were bananas! I got soooo many messages about the suit I wore on my final episode of PRAS that I had to create a video for it! But can I just tell you why I love the Kimberly Goldson collections sooo much? (Yes, ok...) Because the pieces stand the test of time. This suit was from our Fall 2013 collection and here it is 5 years later and it is still fire! So since you asked how you can get your hands on it, I have good news and great news. The good news is that you inspired us to create a sample sale of some past goodies for you. The great news is, although the pieces are limited, you can get them first as a member of the KG VIP section (bottles popping). Sign up to get the private link when the page opens up tomorrow morning at 9am est. But don't delay. We're opening it up to the public on Monday. Also sign up to get today's video on how to wear this look and other "Metallics During the Day". and please leave comments; I want to hear from you and I do respond! I don't know about you but I'm having a blast! On the blog you will also be able to post comments. I'm personally responding to everyone who comments. This content isn't posted anywhere on social media - remember - to get in on the exclusivity, sign up for the email list so that you don't miss out! More to come. I was thinking about you the other day and I said to Shelly that I wanted us to share more with you - to show our appreciation more (because we can't say thank you enough for your support) - but what and how? And then you answered it for me. What I heard the most during my time on All Stars was: That outfit you made was dope and you pulled it together in the nick-of-time, but how do I get that Kimberly Goldson suit you were wearing? I'm rooting for you, but can you tell me what shade of lipstick you have on here? (Insert screenshot) And where did you get those earrings you had on in the confessional of episode 7? To answer as many questions as I can about what I wear and how I wear it, I've decided to create exclusive content only for you, here through this newsletter. So in addition to what I'm doing (creating beautiful clothes for KG, appearing here and there) I'll also share design secrets, styling tips and tricks and how to get the most value out of your wardrobe! To get the link to this exclusive content, click below and sign up for our email list. Once you join KG VIP, please leave comments on the page and let me know if the clip was helpful and what other types of content you might like to see. Please help me celebrate the best part of Kimberly Goldson: Shelly Powell! 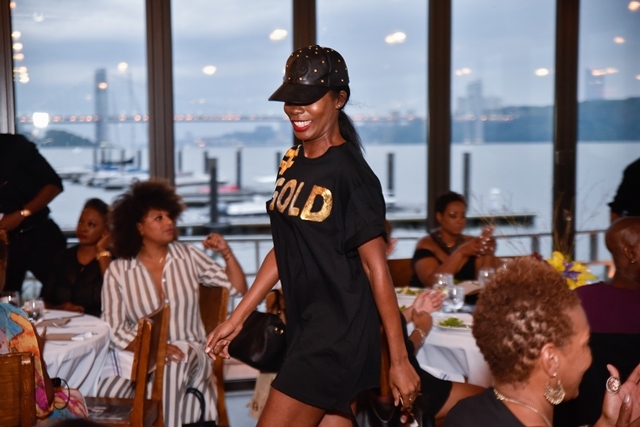 What many of you may not know is that Kimberly Goldson - the brand - is the brainchild of the one and only, Shelly Powell. She believed in my creative talents before I fully did and she generously partnered to add her business genius. She works tirelessly behind the scenes - where very little credit and fanfare is given - but her sweat equity is all over the deals we close, the website that's always fresh and every order that you get on time with the best customer service in the business. She stays fresh in KG! The best sister, partner & best friend a girl could be blessed with! Kimberly Goldson is heading to Bevelations! I'm SOOOO excited for this week! I'm hanging out with some of my favorite people for both work and play! Thursday, March 8th at 5:30p! I'm sharing the real deal on my Project Runway All Stars experience ¯_(ツ)_/¯ and what's next for me personally :-| and Kimberly Goldson the brand :-). While I didn't win Project Runway All Stars Season 6, (they're haters) I'm still winning! Guys: Your exclusive moment is here! You've been asking for a while, "when are you going to make something for men"? Here you are and you're welcome! The exclusive "GOLD-SON" hooded sweatshirt is available for a limited time, so hurry. And not to be left out ladies, you can grab your hoodie dress. We are so excited to bring you the KG HOME collection! To set it off, we have luxurious pillows created in the same spirit as the Kimberly Goldson womenswear collection: lavish textiles in vibrant hues for those who dare to be fearless, vivacious and distinctive, and now at home as well. And if you want to "co-or-dinate", there's that too. Wishing you love, peace and HOME! Be sure to watch Kimberly on Project Runway All Stars in January 2018! What we love about this Autumn 2017 collection is that we get to offer it “in season” for the very first time. So no longer do you have to wait 6 months to get the latest trends: you can buy it now AND wear it now! Inspired by my travels to the Middle East and South Asia, this collection boasts the opulence of the region. I've never been known to shy away from bold hues, vibrant prints and luxurious textiles and this season stays true to form. “Metal Mania” is at the heart of everything I am as a designer. With the last name Goldson, it seems only right! :)) When you're in KG, you are committed to shining in the spotlight. Gold foil floral prints and our #GOLD tees and sweatshirt will do the trick. “All Black Everything” or “Dressed In All Black Like The Omen”, (take your pick), is where I sprinkle my Brooklyn Blackgirl Magic! This time I took classic shapes in wool crepe and added vinyl trim to edge it up a bit. Try “Striking Stripes” when you don't want to do too much. Navy and black is such a chíc and timeless combination that you can dress up or down. 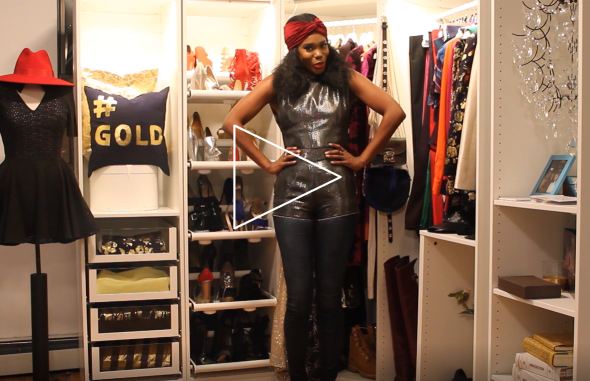 Speaking of which, stay tuned for “The Designer Diaries with Kimberly Goldson” video series to get inspiration and tips on how to incorporate your KG garments and other special pieces from your wardrobe into your everyday life. Being born a Brooklyn baby I had no idea of where my life would take me. Then being a little girl who loved playing dress up I didn’t know how many women I would eventually dress. Now I’m a grown woman who’s a full time designer and my path has taken me to places far beyond my fashionable dreams. In May the map of my life led me from Brooklyn, NY to Dublin, Ireland as I was invited to feature my designs at the Dipili Boutique. “An eclectic boutique in Dublin’s city center featuring a collection of beautiful pieces from emerging and established designers from around the globe”. Founded by a dynamic pair with roots in the US, Africa and Europe, the three of us intersected in a most powerfully stylish way for a three day event including a press preview, personal meet & greet and trunk show. Dublin welcomed me with classically cool architecture, cosmopolitan crowds and inspiring sights that made this Brooklyn woman’s heart open with a home away from home love. It was like I was floating on the River Liffey through the city to the doors of the boutique with my designs beautifully displayed on elegant mannequins, perfectly placed racks and in framed photographs lining the walls of the fabulous space.